Before I start I’d just like to say that this is a wonderful little book that you should definitely read , so if that’s the only recommendation you need then there is no need to read the rest of the review. If not, please carry on. 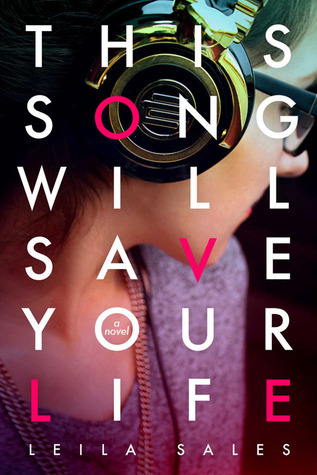 I picked up This Song Will Save Your Life randomly at the library purely because I liked the look of the cover, and the blurb looked vaguely interesting. I know that this is a habit I really need to break, but maybe it’s not that bad if it lead me to this fantastic book! Elise, our protagonist, is definitely a character that a lot of readers will relate to, if only a little bit. She has a very strong voice and Sales easy to read writing style made Elise's story fly off the page. Elise is not only bullied, but seems to be completely ostricised by her peers. We are never really given a proper reason as to why Elise is bullied and excluded, which leads me to believe that there wasn’t a proper reason at all. Elise your typical I’m-just-doin’-me heroine, which I have absolutely no problem with, but that’s just how I would describe her. Elise may be different but only slightly different. I’ve seen a lot of these kind of people over the years, people who are just different enough not to fit in, to be pushed to the fringes. The other kids actively exclude Elise for no particular reason. This is probably the most accurate depiction of bullying of ever read. Normally kids who are bullied in novels are told that their tormentors are jealous or under-confident, and many other reasons, but in real life this rarely rings true. Some people are bullied simply because children, and people in general, can be very cruel. However, Elise is by no means perfect. She is hell bent to criticise everyone and anyone she doesn’t get on with, and hates almost everything mainstream, music, fashion etc. Years of being bullied has put Elise on edge and sets her against almost everyone, even the people who care about her. Ironically enough, she spends a lot of time complaining about not being popular, and then criticises others for not reaching her standards hipster coolness. I cut Elise a bit of slack, because despite how judgemental she can be, she pales in comparison to how cruel some of her peers can be. Sales also deals with the undefinable, un-understandable concept of popularity. Elise, who is quite pedantic, spends a lot of her time trying to figure out the rules to being popular, before figuring out that there are none. Sales expertly conveys popularity as a fluid, incomprehensible concept that we’ll never really fully understand. No one can put their finger on what makes one person popular and the other not, and Sales doesn’t provide any new insights. She even suggests the idea that popularity is what makes people mean, and once you remove that we’re just fine. If you are a music fan, which you probably are if you’re reading a book called This Song Will Save Your Life, this is a fantastic book for you. The music plays a huge part in the narrative of the novel and gives us an insight into the characters and the atmosphere of the novel. It reminded me of The Perks of Being a Wallflower in that way. In my copy there was a list of songs in the back so I could look up the ones I didn’t already know. This Song Will Save Your Life also has some unusual relationships. The contrast between Elises friendships with Vicky, Pippa, Sally, Chava, Harry and Amelia shows that friendships can come in many different forms, are never straight forward, and just because someone isn’t your soulmate doesn’t mean you can’t be friends. Elise’s relationship with her little sister Alex is also extremely important to the story and one of my favourite parts in the book, showing me that we can sometimes be very misguided in doing what we think is best for the people we love. Elise’s relationship with Char is also very interesting. To me it was the opposite of the annoying teenage relationships found in most YA novels, and with this relationship Sales embraces all the holes that can be found in fictional young love. None of these relationships are cliched or over done, and I applaud Sales for her originality. Overall I really excellent book, perfect for teenagers of all ages. I would really recommend it to anyone who enjoys contemporary young adult fiction.